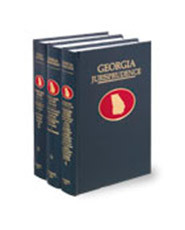 These volumes present a modern, comprehensive statement of Georgia law covering personal injury and torts (Vols. 13, 14 and 15); business and commercial law: business torts and trade regulation (Vol. 4); and workers’ compensation (Vol. 12). They provide a thorough statement of substantive law with practice commentaries, and can also be purchased as part of the full set of Georgia Jurisprudence, the companion set to Georgia Procedure.